So as you grow up you notice that your family and other families tend you have 'family traditions' - such as opening one present on Christmas Eve or always having warm milk and cookies before bed, or going to church on Christmas Eve to sing hymns - the traditions are endless and I'm not going to ramble on about them but as we grow up - the traiditions I feel seem to stick with us and one of those traditions (which is probably the same for lots of people) is watching Christmas films or films that you would normally only watch around Christmas either because they are a Christmas film or are Christmas themed/set at Christmas. 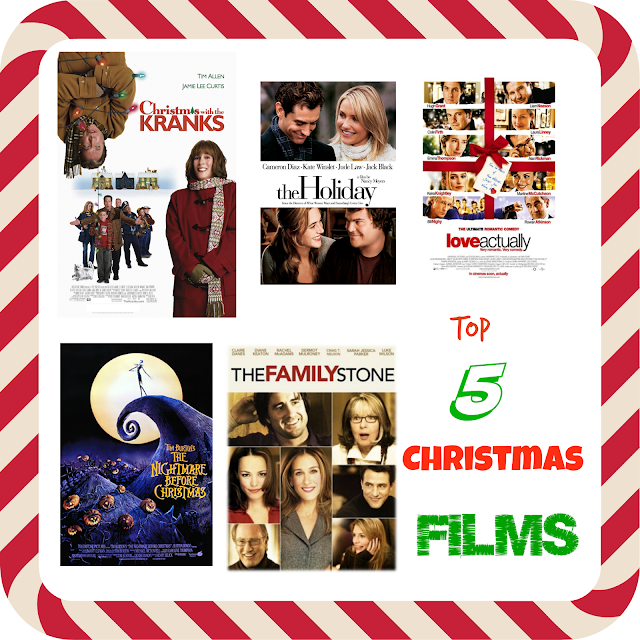 I've chosen my top 5 that I always watch around Christmas and thought I would share them with you guys. A comedy - Luther and Nora Krank see their daughter Blair off (she is going to the peace corp) and won't spend Christmas with them. They both decide that instead of spending lots of money on Christmas they will go on a cruise and not celebrate Christmas. Their neighbours aren't happy. Just before they are about to leave - their daughter calls and tells them she's on her way home. They panic and decide to have Christmas after all. So then its a big race to get Christmas back on before their daughter gets back. I really love this film - it's about two woman who decide to take part in a 'house swap' - they swap houses, cars etc. They chat to each other before swapping houses and both are assured there are no men in the vicinity - as both are trying to 'get away from it all' for a bit. Funnily enough they both fall in love with local men however both don't commit fully as they know they will eventually have to return to their lives and this may end the relationships that have started. The main reason I love this film is that the story revolves around nine different stories - sometimes it is hard to follow it because the film is darting all over the place to each story - but I still enjoy it none the less. This is one of Tim Burton's films and I really like it. The story is about Jack who is a resident of Halloweentown and is bored of scaring everyone at Halloween. By accident he dicovers Christmastown and decides to try and control Christmas but finds out its harder than he thinks. This film makes me cry every year. So if you don't like upsetting films - don't watch this. The film is about one of those traditional American families - they're a big family, all the kids come home for dinner - the mother is the glue that keeps the family together and everyone loves her. We then find out some upsetting news ... and I'll leave it there as I don't want to ruin the film if you plan to watch it. So there you have it! My 5 favourite Christmas movies - are any of these your favourites? Let me know in the comments or comment me and let me know if there is any I should check out.